The International Finance Corporation just became more responsible, after a number of decidedly suspicious staff moves. 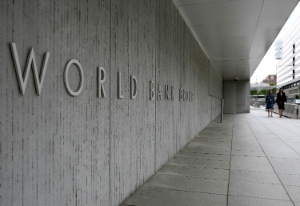 The International Finance Corporation, the World Bank’s private sector lending arm, put itself on the naughty step this morning after a number of suspicious moves by executives prompted it to change its rules for staff engagement, thereby stopping its ‘revolving door’ (or slowing it down, anyway). The moves in question involve Thierry Tanoh, the IFC’s former vice-president for Latin America, sub-Saharan Africa and western Europe, and ex-chief executive Lars Thunell. Tanoh was appointed chief executive of pan-African Ecobank Transnational in July last year, the day before the IFC increased its investment in the company by $100m - which, one banker told the FT, gave the impression he had ‘arrived with a dowry’. Unfortunately, things haven’t gone smoothly for Tanoh since he joined the bank: he’s currently being investigated by Nigeria’s Securities and Exchange Commission for alleged breaches in corporate governance, and is engaged in a boardroom battle over ‘chronic mismanagement’. Thunell, on the other hand, was appointed to the board of Texan oil firm Kosmos. One of its projects is offshore oil exploration in Ghana - financed (in part) by the IFC. Now admittedly, these could have just been coincidences - but, as the World Bank has pointed out, it has a responsibility to act as a role model for corporate governance because it’s run with taxpayer’s money. Because of that, the organisation has made ‘significant changes’ to staff rules, including ‘closer monitoring’ by the IFC’s audit committee as soon as employment negotiations begin, and rules on how long a senior member of staff must keep their distance from the IFC once they resign. ‘We take our ethical commitments very seriously,’ insisted an IFC spokesperson. Well, quite.